As Britain considers changes to its current adoption laws, freelance writer Teodora Totorean looks at pro-birth politics under communism in her home country, Romania. While in the UK British women took full advantage of the sexual revolution and feminist movements of the 60s, other women around the world struggled to have a voice. From the compulsory following of a strict dress code in some Far-Eastern countries to the denial of control over their own sexuality in East European ones, a lot of women have been the victims of some type of abuse, whether religious, cultural or social. In Romania, starting from the late 60s and up to 1989, the abuse was political. On 1 October 1966, the then president, Ceauşescu, signed off a decree that changed women’s sexuality and health care for over three decades: the banning of abortion. As this was one of the main birth control methods at the time, the decree interfered in the most intimate aspects of a woman’s life. The pro-birth politics practised by the dictator were supposed to give the country a pure communist generation in order to strengthen the nation. With some exceptions – women over 45, mothers of five or more children, at risk pregnancies – abortion was illegal and doctors and patients faced prison. The IUD (intrauterine device) was also banned and the contraceptive pill went from being rare to completely absent from pharmacies in 1985. Left with no other choice, some women went on to have illegal abortions, resulting at times in failure to terminate the pregnancy, damaging the health of both the child and the mother, or even in death. The dictator also fined anyone over 25 who wasn’t married, as well as married couples who hadn’t had children after two years – getting married and giving birth weren’t only matters of personal choice but a duty to the country. One of the changes that took place immediately after the uprising in 1989 was the liberalisation of birth control methods. Yet the sociological and demographic impact of the 1966 decree still exists. Romanian women are still healing from the wounds left by the communist regime. While some postpone marriage and motherhood, with worrying consequences for birth rates, others continue to abandon their babies. Statistics show that there is one abandoned baby every six hours, which puts Romania first among European countries. Poverty still plays its part, but so does the prejudice of having children outside marriage which is deeply rooted in Romanian culture. There are indications that social workers and educators are trying to find viable solutions to the problem. The advice on a foster home website for priests, teachers, parents and community members to be tolerant towards those mothers is a good example. Currently there are 40,000 infants in orphanages, far fewer than the outrageous 170,000 in the communist era. 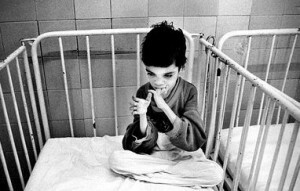 Before 1990 the issue of abandoned children and the conditions in which they lived were hidden from the general public. But now the international press monitors Romania’s progress in eradicating these institutions – since this was one of the conditions for the country joining the European Union. So Romania decided to do something positive about its orphans. It identified that the number of families interested in adopting exceeded the number of children available for adoption. In July 2011, the Romanian television network Pro TV started a campaign – “I want my parents too” (Vreau şi eu părinţii mei) – to change the adoption law, by modifying the criteria by which an infant could be declared available for adoption. Previously the law aimed to re-integrate the infant into their extended family as far back as four generations which made adoption a very long process. As most families want to adopt children under three, the children were often too old by the time they were finally put up for adoption. Over 75,000 people signed a petition supporting this change, which were approved in November 2011 and implemented in February 2012. Now infants are put up for adoption after one year of no contact from their families. New born babies abandoned in hospital are put up for adoption after 30 days if the mother and the family do not indicate that they want them back. These changes could have a positive impact not only on Romania’s image, dominated by orphans over the last two decades, but also on people’s attitudes towards contraception, social status and prejudice – elements that still play a big part in (single) women’s decision to have and then to bring up a child in Romania.